Zarqa Nawaz and Anita Majumdar take a selfie to conclude the evening. 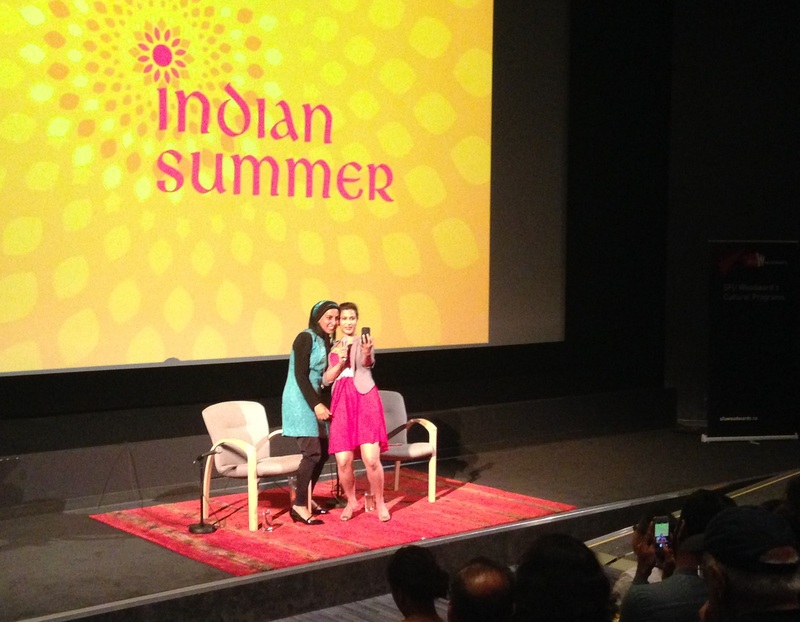 The evening concluded with a conversation with Zarqa Nawaz with award-winning Vancouver actress, Anita Majumdar. Just like a true weaver of tales, you learned more about her not through a direct response to questions asked but through the details in her stories. Starting in journalism, Zarqa found it dull to just cover the news and much more rewarding to craft stories. Later on, as a producer for Peter Gzowski’s Morningside, she was emboldened by Peter’s obvious enjoyment of working as a storyteller and decided she wanted to tell her own. She also found out along the way that she was quite funny. As a Pakistani Muslim woman, Zarqa had a unique advantage when it came to pitching a story set in a Saskatchewan town about a Muslim community and their new mosque and imam. But she also found her identity isolating and her credibility was constantly challenged in the industry. Audience feedback could also be negative and Little Mosque’s critics came from Muslim and non-Muslim communities alike. Muslims didn’t want “their dirty laundry to be aired” while non-Muslims alleged that “humour [was] making Islam palatable” and therefore weakening the fearful image that had been constructed post 9/11. Instead of crumbling under the scrutiny, Zarqa found that continuing with Little Mosque made the show a “moving target” so that critics could not keep on top of their grievances; more and more naysayers found aspects and characters of the show funny and rang true with aspects of their own lives. Sometimes, it was not even humour that caused people to resonate with Little Mosque, but watching Muslims participate in the mundane (going to work, arguing with spouses, dealing with annoying neighbours) that turned the “other” into just another human being. In her new book, Laughing All the Way to the Mosque, Zarqa relished the opportunity to delve deeply into a character, whether that was herself as a child, her mother, or her children. The author found describing someone’s inner dialogue or telling the background of a mortifying story was better conveyed in print than it was through television. That evening, Zarqa read an excerpt from her book, a childhood memory of wanting to play with other children while feeling like she didn’t fit in because of her “pantaloons.” This story revealed the vulnerability and self-consciousness she felt of being different and her deep desire to be loved and accepted. As an adult, Zarqa seems to still seek understanding but does so with the strength brought about by an assured knowledge of who she is and unabashed love of her work.